Welcome to A Few Bucks Fwd. We forward small items and packages from the UK to the US/Canada for a flat charge of $8.00 per package. You can place an order directly with a UK website that doesn't ship to the US/Canada, but use our address as your shipping address. 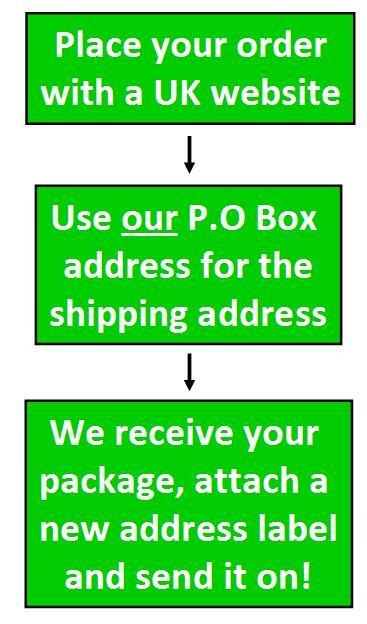 Your package arrives here, we put a new address label on it and attach the correct postage, and send it over to you. This means that you still benefit from the website's customer service, special offers and discounts, and can get hold of products that would otherwise be unavailable to you. WE DO NOT FORWARD ANYTHING THAT IS ILLEGAL LIKE DRUGS OR GUNS, SO PLEASE DON'T ASK. WE DO NOT FORWARD CASH. WE KNOW WHAT MOST LEGIT E-COMMERCE ITEMS LOOK LIKE, AND WILL ONLY FORWARD BONA FIDE PACKAGES. We know you might be sceptical - so please, check around the internet. You'll find LOTS of people saying LOTS of good things about us!